Last night was a night that called for soup. Sunday. After a weekend of reading student essays for me. One of painting the deck for Phil. We haven’t visited some of the recipes in Blue Moon Vegetarian for a long time, since we are creating an entirely new set of original recipes that are both vegan and gluten-free, so this Baby Lentil Stew was a complete surprise to both of us. It has such soul mending flavor. It’s the thyme and that hint of tomato. This is one case where fresh tomato just won’t do, unless you are going to take the time to cook it down into paste. It also might work to puree some sun-dried tomatoes, too. Rinse lentils and cover in boiling water. Cook over low heat until beginning to soften but leave firm. Drain and add potatoes, celery, onion, carrots, garlic, tomato paste, bay leaves, and thyme. Add enough broth to cover ingredients. Bring to a boil. 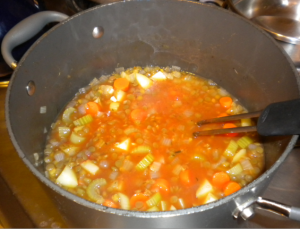 Cover and simmer until vegetables reach desired firmness. Remove bay leaves. Season with tamari or Worcestershire sauce, black pepper, and salt to taste. Allow to rest uncovered for 15 minutes before serving.